Will Obama’s Plan Look Like This? 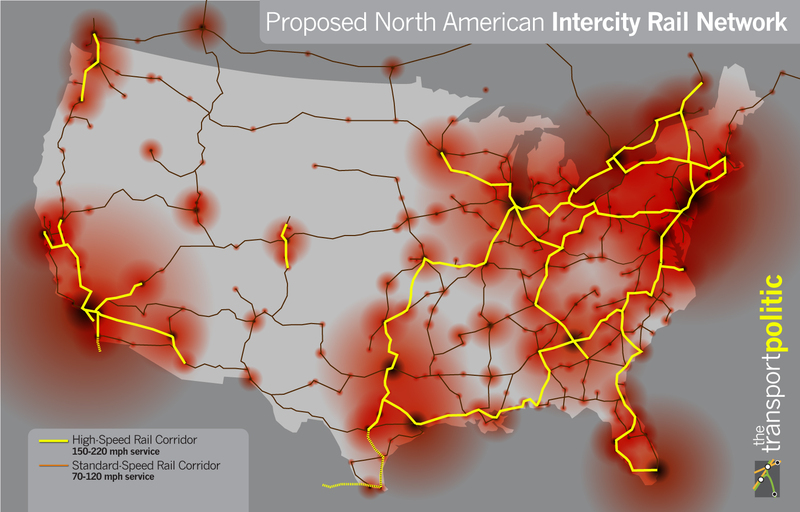 Yonah Freemark at the Transport Politic has created a well thought out proposal for HSR in the United States. Will Obama’s plan look something like this? Unfortunately, probably not. However, the Associated Press has a good article discussing Midwest Regional Rail Plan which is largely reflected in the map above. Nevertheless, the HSR network announced tomorrow will probably be a mix of many projects, and less like Freemark’s well thought out proposal. A new graphic has been posted at Good. It represents system track length and ridership on the most used subway systems around the world. The numbers are impressive; transit works. President Obama will outline his “broad” plans for HSR tomorrow. This site will bring you extensive coverage of this historic event. Last February the Economic Stimulus Package allocated $8 billion for HSR. Additionally there is $5 billion allocated five years in the President’s national budget. CHSRA is requesting half of the $8 billion up for grabs, but there is strong competition. A brief summary of the projects that may be announced tomorrow is available at the Transport Politic. The Federal Railroad Administration’s (FRA’s) website also a has a list of HSR corridors that might be addressed by President Obama. A map of these corridors is picture bellow.